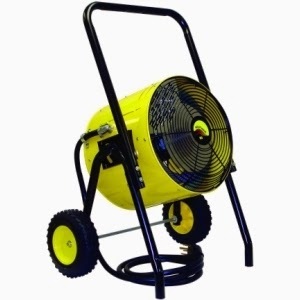 Free Shipping on TPI Corp./Fostoria Portable FES Heat Wave Electric Indoor Space Heaters - Mor Electric Heating's Blog about home, office & factory comfort heat & freeze protection for pipes & roofs. All TPI Corp./Fostoria Portable FES Heat Wave Electric Indoor Space Heaters qualify for FREE GROUND SHIPPING!!! This electric indoor heater eliminates the hassles of fuel-fired heaters. It requires no fuel. Produces no flames. Needs no late night monitoring, and does not require regular maintenance. If your indoor temperature is 10°F….you could use a 15KW, 240V model to heat up to 12,800 cubic feet of insulated new construction. Normally, this would produce a 60°F temperature rise in about 2 hours. Once the desired temperature is reached, the thermostat will cycle the heater on and off to hold the desired comfort level. To achieve this, the 800 CFM fan recirculates and warms the air more and more each time it’s drawn through the heater. For best results, use in an enclosed air space with a ceiling height of less than 15 feet.